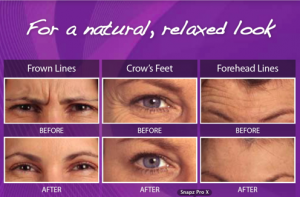 BOTOX ® is a purified protein extract. Since the early 1980s, it has been known that this protein can be safely used to control facial muscle spasms and tics, treat eyelid tremors and other ocular problems, and to control excessive perspiration. It has also been proven to significantly reduce chronic frontal tension headaches and migraines, and, as you probably have already heard, is especially effective in reducing dynamic wrinkles of the upper face. At Erme Clinic we carry out careful assessment of the patient’s concerns, followed by full consultation on the treatment options available and only then would we decide whether Botulinum toxins are a suitable therapy. BOTOX ® is administered with an extremely fine needle directly into the targeted facial muscle. The protein then blocks the transmission from the nerve ending to the targeted muscle. As a result, the treated muscle relaxes and the dynamic wrinkle is softened. This effect generally lasts from two to six months. BOTOX ® is now widely used by physicians throughout the United States to control or reduce facial dynamic wrinkles. Administration of BOTOX ® is a relatively pain-free procedure, and an ideal treatment for those patients who wish to avoid significant invasive surgery or want to minimize their time away from work or other family responsibilities. How do you inject BOTOX ®? BOTOX ® is injected into the targeted muscle using a very fine needle. Usually several injections are given per muscle. How quickly will I see the results of BOTOX ®? BOTOX ® usually starts relaxing the treated area within several days. These are expression lines such as frown lines, brow lines, crow’s feet and bunny lines that become prominent with age, sun damage, and excessive facial muscle activity. Cosmetic denervation with BOTOX ® is a simple and safe procedure. BOTOX ® is injected into a targeted facial expression muscle, blocking impulses from the nerve to the muscle, thereby relaxing the muscle so it does not contract. This in turn causes the overlying skin to become smoother, with fewer lines and wrinkles. After treatment, the overlying skin remains smooth and unwrinkled, while the untreated facial muscles contract in a normal fashion, allowing normal facial expression to be unaffected. By using facial muscles repeatedly throughout a lifetime, the skin is creased in areas of greatest use. The aging process causes the slow down of collagen and elastin production in the skin so that as we get older, these areas of over-use become damaged and the lines become permanent. By reducing the movement of muscles in these areas, the skin stops being creased and is allowed to recover, causing the lines to soften or even fade away. In the areas treated, the muscles are temporarily inactivated for a few months, during which time the patient can break the subconscious habit of overusing these muscles. The relaxation of the muscles varies depending on each individual and the dose used. Rarely an individual may show a resistance with no effect on the treated muscles. For the first couple of years, frequent treatments are required to ‘re-educate’ the facial muscles. Thereafter, treatments would be less frequent until a yearly maintenance treatment is normally all that is required. How soon does it work and how long does it last? The effects usually last from 2 to 6 months. The treatment may be repeated as often as desired. What are the side effects of BOTOX ®? The most common side effect of BOTOX ® is slight bruising from the needle stick. In rare instances, an adjacent muscle may be affected, causing eyelid weakness for several weeks. No serious side effects have been reported in thousands of patients over a ten-year period. In extremely rare cases patients have developed an allergy to the treatment. The muscle injections are given with an extremely fine, short needle, so there is only minimal discomfort. Topical anaesthetic creams or ice can be applied to the skin prior to the injections. The area may have some slight redness and swelling which normally resolves in an hour or two. Are BOTOX ® treatments safe? BOTOX ® injections have been used safely and effectively for over ten years to treat many ophthalmologic and neurological disorders. Each year, thousands of patients receive BOTOX ® treatments for a variety of conditions, and it is quickly becoming a popular treatment for reversing the visible signs of aging. Cosmetic denervation with BOTOX ® is a simple and safe procedure. Using a tiny micro-needle, a very small amount of BOTOX ® is injected, very precisely, into several locations on the face. Because the needle is so fine, and only a tiny amount of liquid is used, the discomfort associated with the injections is minimal. Most patients compare the sensation to an insect bite.